In 1984, Barry Marshall grew a little H. pylori in his fridge, ate it, and went down in history for discovering that the source of stomach ulcers was bacterial. You can grow all kinds of interesting things in your fridge and food cabinets. 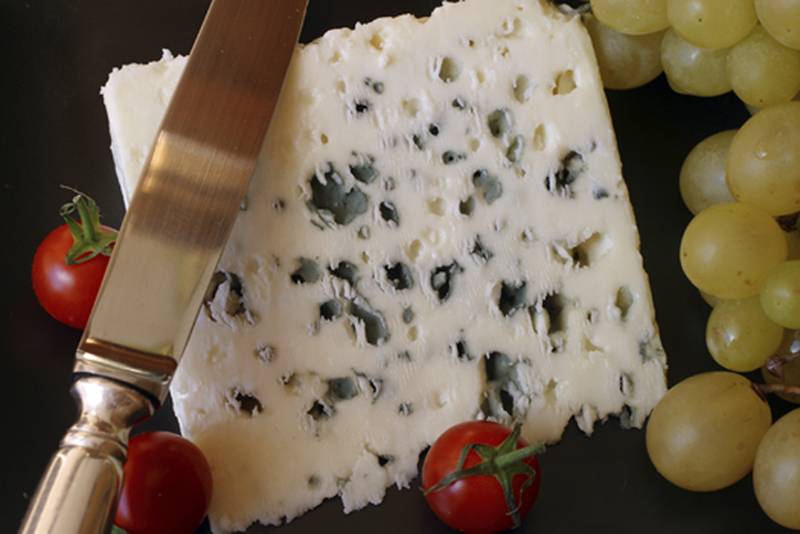 Some foods, including the stinkier cheeses of the world, get flavor from mold cultures. Others, such as bread, should really not be green. That thin snowy layer on top of that old cup of coffee? The thin green film on your bread? The gray fur on that old, forgotten Indian food? Mold. Molds are microscopic fungi that live on the surfaces of plant and animal matter. They travel by releasing spores that are pretty much everywhere, and are usually harmless. However, some molds release toxins that can cause serious food poisoning and respiratory problems, and it is impossible to tell the innocuous from the dangerous by sight. No matter what your dad or gross brothers were willing to eat out of the fridge, you should not just scrape off the mold and eat the parts that “look okay.” The mold that you see on the surface is actually just the spores from the mold. When mold colonizes a food, it sends long, thin roots that you can’t see deep down into its host. So even if the pretty colors have been scraped away, you could still be eating potentially poisonous toxins. Many cheeses, including Roquefort, blue, Gorgonzola, Stilton, Brie, and Camembert are created by intentionally introducing molds that are safe to eat. Hard cheeses with surface mold can still be eaten if you cut off at least one inch below the growth. Mold roots generally cannot grow deeper than 1 inch below the spores on hard cheeses. Molds and mildew may also form in damp areas of your kitchen – the bottom of your fridge, under the sink, and in the crisper. In extreme cases, touching and inhaling these growths can cause allergies, headaches, nausea, asthma, fatigue. Because molds release spores into the air that may settle on other foods even once you’ve cleaned out the offending items, you want to do your best to prevent those little fuzzy gardens from growing in the first place. Clean the inside of the refrigerator every few months with 1 tbsp. of baking soda dissolved in a quart of water. Scrub off any visible mold (usually black gunk) with bleach or vinegar (I recommend using the vinegar recipe found here, since many chemical mold killers contain chlorine bleach, which, when mixed with water, can form hydrochloric acid, which is fatal if swallowed and can cause chemical burns). Keep sponges and dishrags clean – if they smell musty, you’re just spreading the mold around. Keep foods in the fridge covered with plastic wrap or tinfoil. Wrap food items in a plastic bag and throw away immediately. I know there is a temptation to keep it around and see what happens, but, no. DO NOT SNIFF THE MOLDY FOOD. Why do people do this? Mold spores can cause serious respiratory problems, so sniffing the food is not a good idea. If you can see the mold, it’s bad, no matter what it smells like. You’re going to sniff it anyway, aren’t you? Fine. Just don’t say I didn’t warn you. So you’re running a little low on cash. Alright, maybe you aren’t, but I sure am, and canned goods are a cheap, usually healthy option to get me the through the week. But how do you know what is safe to to eat? Will that dent on the side kill you? Or just save you a few pennies? The concern with dented cans is Botulism. Botulism is a spore-forming bacteria that forms in oxygen-free environments with low acidity and releases toxins that cause causes blurred vision, dilated pupils, droopy eyelids, sore mouth and throat, muscle weakness, difficulty swallowing, difficulty breathing, and major muscle weakeness and paralysis. Sympotms usually develop within 12-36 hours after consuming contaminated food. Thanks to improvements in canning processes, botulism poisoning is rare, but it can be life-threatening. Cans with small dents along the side are generally still safe; however, deep dents, especially near the seams of the can, should always be avoided. Always stay away from cans that are leaking or bulging – these are clear signs that the seals have been broken and botulism contamination is likely. If a can explodes when you open it, throw it out immediately and carefully clean up the mess with soap and water. If you suspect botulism poisoning, go to your local emergency room immediately. When it comes to swollen or broken cans the rule is always when in doubt, throw it out.